Welcome to our Football Acca Tips review, a betting service that provides weekly Accas and single bets for the Premier League. We have finished with a £79.45 loss at the available odds following the advised stakes which works out as a 7.9% decrease to our starting bank. We have felt as though the service is more of a "just for fun" tipping service as it doesn't seem to be based on value betting and it is notoriously difficult to profit from popular premier league markets. The bookies put a lot of effort into scrutinising these markets and ensuring the odds are accurate, so it's tough to find any value. Although we did hit a winning accumulator bet, we were advised to use a £1.00 stake and the winnings were quickly handed back after a streak of losing single bets. The performance of the tips over four months has been poor and the single bets haven't provided consistent enough profits to keep us afloat whilst waiting to land a big acca win. On that basis, we are going to stand by the original "fail" rating that we gave this service the first time around. It has been another losing month for Football Acca Tips in our review with a further loss of £54.40 which brings our total loss up to £74.25 at the advised stakes. That works out as a 7.4% decrease to our bank, so we still have plenty to play with. The nature of this service does mean waiting a bit longer for the chance of a big acca win so we will continue tracking bets for a further month or two. It's been a tough month for Football Acca Tips and unfortunately we have given all the profit made last month back to the bookies. There was a bad losing run of 21 bets in a row and in the end we finished with a loss of £61.60 at the available odds. That gives us an overall loss of £19.85 for the re-trial so far, which is far from being a disaster as it represents just 2% of our starting bank. It's been three years since we completed our review of the Football Acca Tips service, so when Andy got in touch with us recently about a re-trial we were happy to take another look. The service has changed slightly and there are now the "Main Selections" and the "ACCAs". The Main Selections are usually match winner or BTTS bets and the Accas combine several bets for upcoming English Premier League matches. In the first month of our re-trial we have made a profit of £41.75, following the advised stakes which have been between £1 and £15. Andy has advised a starting bank of £1,000, so there has been a small increase of 4.2% so far. The highlight of the month was a 62/1 winning acca, giving us a profit of £62 from a £1 bet. We have been recording the results for Football Acca Tips for 3 months now and it’s time to conclude our review. It’s been a bumpy ride from the start, with a loss of £29.54 in the 1st month, followed by a 95/1 winner in the 2nd month, which catapulted us back into profit. Unfortunately the 3rd month has proved difficult again, resulting in a loss of £31.20. Overall, we have finished the three month trial with a loss of £12.54. When we first started the review, Football Acca Tips had three components – Confidence Tips, Standard Tips and Acca Tips. The tips were emailed out before the weekend for the English Premier League fixtures, and there were also occasional midweek tips for cup games and European or International fixtures. Odds and stakes are advised with each selection, and there has been no problem getting the required odds – in fact a lot of the time we were able to get significantly better odds using an odds comparison website. The Confidence tips are mostly Match Odds selections, which were set at £5 stakes. These tips didn’t perform very well at all, with a total loss of £39.25, which led to them being scrapped during the 2nd month of our trial. The Standard tips are made up of what we would call “long shots”, which are basically speculative bets at long odds. The majority of these tips were Correct Scores and Scorecasts. These have had a low strike rate of 11.4%, as you would expect, with average odds of 42.76. There were also some shorter priced selections that were often for the Anytime or First Goal Scorer markets. These tips gave us a profit of £45.90 over the three months… but without the lucky scorecast winner they would have been in much worse shape with a loss of -£49.10. Finally the Acca tips have consisted of a mixture of doubles, trebles, fourfolds, etc. and even a sevenfold on one occasion. These have also had some changes since the start of the trial, with a lower risk method being introduced. Some of the accas are now split into multiple bets, similar to a Yankee. This means you get paid out even if only two selections from your acca win. Overall the Acca tips failed to impress us, making a loss of £19.19. The new method acca selections finished at scratch overall and definitely reduced the risk compared to the standard accas. This does seem like a positive move for the service going forward. It’s also important to point out that at our lowest point during the trial, we reached a loss of -£72.97. The starting bank was recommended at between £50-£100, so we were really close to going bust here had it not been for Ayew’s lucky goal. Despite the poor results, this service does put the fun back into betting. We cannot lie – sitting back and watching the match with a scorecast or an acca running definitely makes things more interesting. The point is, do you really need to pay for a betting subscription to do this? It’s a shame that the confidence tips were not doing the job, as some small profits to tide us over would have certainly helped, whilst waiting for one of the pension maker accas to land! At the time of writing, Football Acca Tips is available at £4.99 for the 1st month, then £14.99 a month, which has increased by £5 a month since we started the review. The season pass is no longer available – however Andy is currently offering a lifetime membership for £125, but as this is a Black Friday deal it’s likely to be taken down soon. 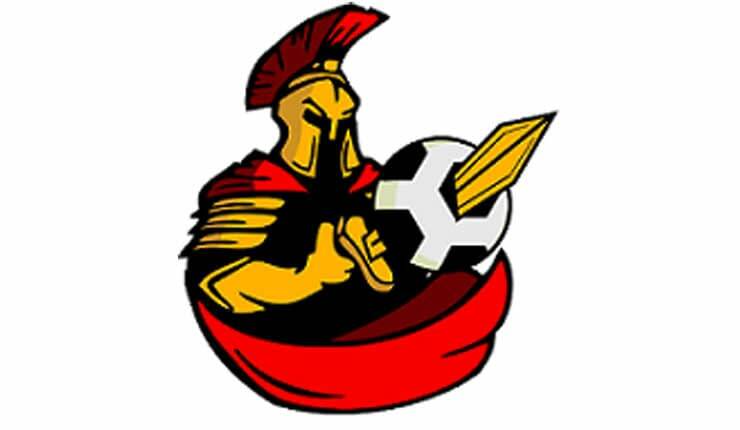 We did expect better from this service, and based on the results of our three month trial, regretfully Football Acca Tips has resulted in a “Fail” rating. It’s been two months since we started our review of Football Acca Tips and after a disappointing start last month, we were left hoping for a dramatic turnaround. It looked like more of the same this time round, but then Andy only went and tipped a 95/1 scorecast winner! There have been a few changes to the service since the last update. There are no longer any Confidence Tips, just Accumulators and Standard Tips. This means most of the selections are long shots, with the average odds this month at 18.44 for the Standard Tips. 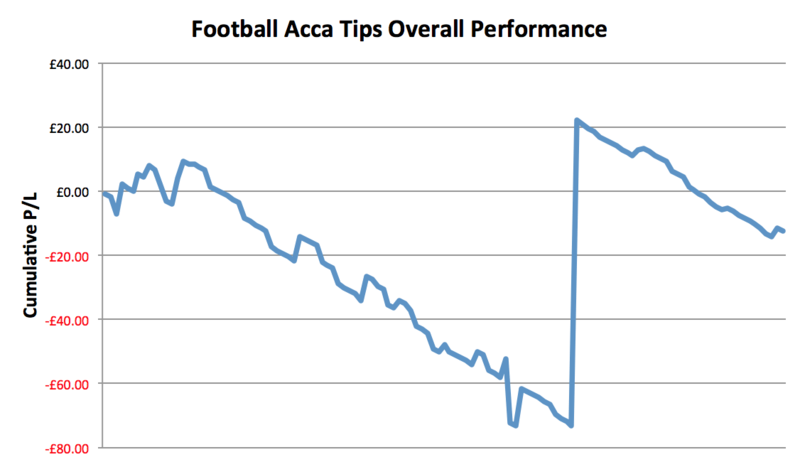 The way the Accas are played has also been altered – they are now split into multiple bets. For example if we have 4 selections in the acca, they are placed as 6 x doubles, 4 x trebles and 1 x fourfold. This is otherwise known as a yankee bet on the sportsbooks. It increases your chances of getting a return on the bet, so we shouldn’t face the long losing streaks like last month. The changes were implemented midway through the month, so the results will include some of the selections from the old system. So this month puts us at an overall profit of £18.66 since the beginning of the trial. The new Acca format has had a positive start and it’ll be interesting to see how this lower risk method performs. We’ll be back next month with a final update of our results. We are at the end of our first month trialing the Football Acca Tips betting service. We did have a winning accumulator during this time, but unfortunately it was one of the shorter priced selections. There were some huge odds for some of the tips – the biggest being one of the “Pension Maker” Accas, which would have paid out £1366.55 from a £1 stake. Sadly we didn’t come close to winning this, as 7/7 legs in the acca lost! We have also been recording the results for the other sets of tips that come with this service – Confidence and Standard tips. The Confidence tips have each been set at £5 stakes (although you can use whatever stakes you want) and at average odds of 2.29. These have all been in the match odds market, with a mixture of home and away wins. There have only been 10 selections for this period and this resulted in a small loss of £4.25. The Standard tips are selections for a variety of markets, including Correct Score, Goalscorers and Scorecasts. The average odds for these have been much higher than the Confidence tips, at around 67/1, and they are between £1-£5 stakes. There have been 24 selections so far, which has resulted in a loss of £14.50. However, it’s worth noting that there were opportunities to cash out some of these bets with a decent profit. For example, one tip we had was Man Utd to beat Southampton 3-1, priced at 25/1. Man Utd were leading 3-1 up until the 86th minute in this game when it went 3-2. There was plenty of time to cash out and make a profit, and the tipster does recommend making use of this feature if the bookmaker offers it. For the purpose of this trial, we will be recording the selections as straight bets with no cashing out. Andy adds an analysis to go with his selections, explaining why he thinks they are good value. It’s obvious that he has a passion for football, and he adds a bit of banter in his emails. We haven’t made a profit yet but at least it’s been fun! At the moment, it’s hard to tell if Football Acca Tips is going to be able to make a profit in the long term. At the end of the day, however much we like this service, we want to make money from it! We will continue our trial for another month and see whether the Confidence tips results improve, or perhaps with a bit of luck we might even hit a big win. With the new football season kicking off, it’s a perfect time for us to try out a football betting service. Football Acca Tips is a service that offers, as you may have guessed, accumulator tips – but that’s not all. Andy sends out a weekly accumulator, as well as his confidence tips, which have proved to be very popular amongst his members. These are sent out 3-5 times a week. Last season he managed to tip a massive 330/1 scorecast winner! He specialises in English football leagues such as the English Premier League and Championship, but also covers other leagues from time to time. The service was started just over 18 months ago, mainly because people call me lucky – I had a knack of picking big price winners. Since then the service has evolved a bit and I am always looking to improve it where I can. I always welcome feedback via email. I am one of the only services that offer help via email from the person that actually is picking the tips… something many will tell you is rare now. My aim is, and always will be, to try my best in improving my user’s chances of winning on their football bets. You can start out with a bank as small as £50-£100, and he will advise what stakes to use in the emails. A bookmaker account where you are able to cash out early is also recommended for the Acca bets. Andy puts a lot of time and thought into his tips, and prides himself on customer service. Other perks include access to a member’s only Facebook group and a dream team with prizes. Football Acca Tips looks like great value for money at just £9.99 a month. Even better, you can get a season pass for a one time payment of £30. We will be reviewing the service over the next couple of months, so let’s hope that we can get off to a good start this season!